This terraced falls cascades over granite ledges into pool after pool on this short, quiet hike. 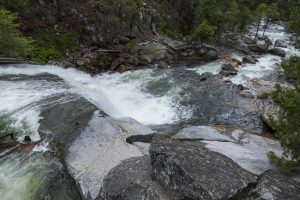 The level trail starts just outside of Yosemite National Park and follows the South Fork Tuolumne River upstream to the park boundary. Here you’ll find the remains of the old Carl Inn, formerly run by Donna Carlon. The trail follows along the banks of the river through the forest with a wide array of flowers in the spring. The trail briefly leaves the river as it steeply goes up and over a ridge through a tricky, poorly maintained section. It rejoins the river on the other side at the base of the cascades. Follow the river up the varied cascades to see the largest cascade dropping into a pool. Trailhead: Turn onto the Evergreen Road towards the Hetch Hetchy Reservoir just north of the Big Oak Flat Entrance. Follow the road for 1mi/1.6km and cross the bridge over the South Fork Tuolumne River. The signed trailhead for Carlon Falls is on the north side of the bridge.